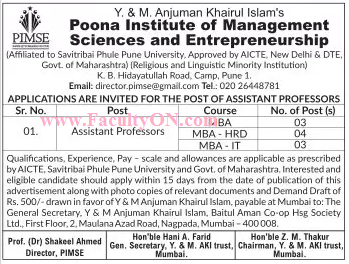 Poona Institute of Management Sciences and Entrepreneurship, Pune has advertised in Loksatta newspaper for the recruitment of Assistant Professor jobs vacancies. Interested and eligible job aspirants are requested to apply with in 15 days. Check out further more details below. About College: Poona Institute of Management Sciences and Entrepreneurship (PIMSE) is an educational institution started in the year 1990 with an aim of providing quality education in the field of Management and Information Technology. PIMSE offers a variety of valuable courses (Full time Programme) such as MBA, MCM, MPM, PGDBM and MBS.